Tornado No. 2 was an EF-2 tornado. In this photo it is approaching state Highway 287 in Arlington. The National Weather Service has once again upped the total number of tornadoes that touched down in North Texas last Tuesday. The latest, an EF-0, touched down in Coppell for about two miles with a width of about 75 yards. NWS investigators said they found a narrow patch of tree and roof damage in the swath. Additional information continues to come into the National Weather Service, and the number of confirmed tornadoes may increase. 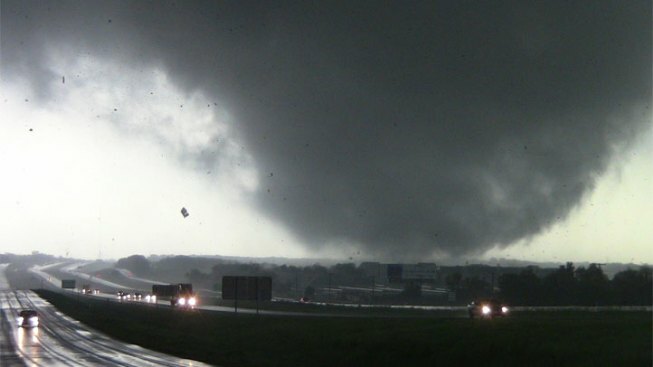 To see a complete listing of all 17 tornadoes that touched down April 3, click here.